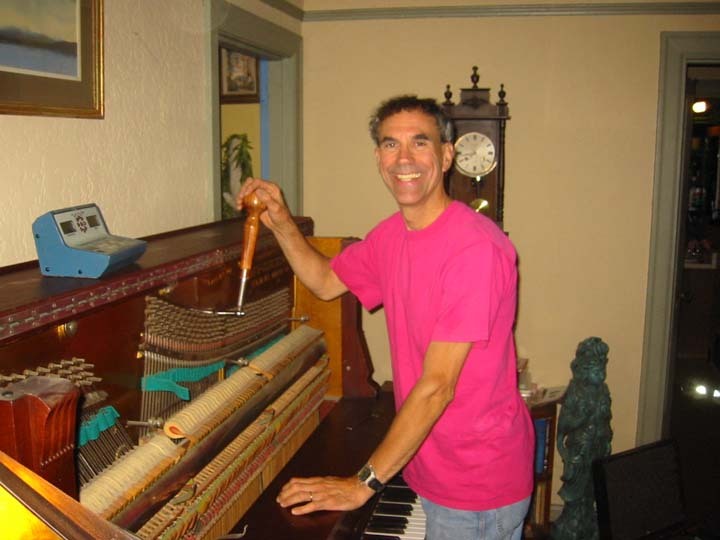 Dean Petrich, RPT, has been servicing pianos since 1973. He has held every office in the Seattle Chapter of the Piano Technicians Guild, including being President for two consecutive years. Dean maintains the library and archives of the PTG seminars convention and technical presentations and is interested in combining efforts with other chapter archivists and PTG Journal collectors. He also maintains the chapter web site. Over the years Dean has received countless compliments for his tunings, at which he excels. Dean has a database of nearly 3000 customers, owns over 150 pianos, and moves, tunes, repairs and rents pianos weekly. If you would like a piano, Dean has pianos for sale, for rent, for trade, and for free. The pianos for sale range in price from $100-$1600. The rentals range from $20 to $40/month, and include half price on moving, a free tuning, and unlimited free repairs. The free pianos don't well or don't work at all because there hasn't been time to devote to them yet. However, if you find one you like, it can be made like new, you can toy with it yourself, or you can have it as-is. Call for an appointment to visit the shop to select the piano you want. So me, Dean, how did you start tuning pianos?